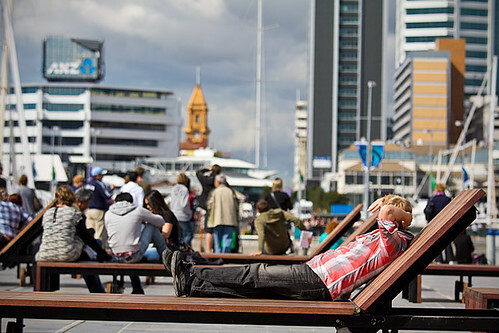 The Wynyard Quarter is part of a formerly buzzing industrial zone in the heart of Auckland. It lies right next to the prestigious Viaduct Harbour with its expensive luxury yachts and stylish apartments and appears rather dull in comparison. 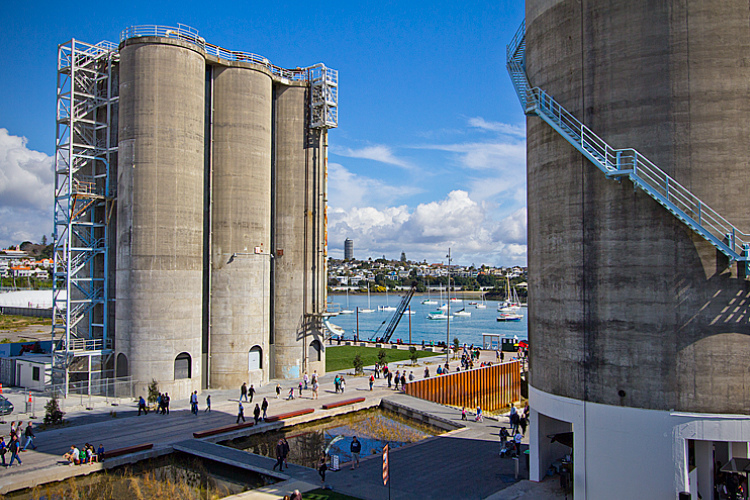 For a long time the Wynyard Quarter was home for a big concrete factory with its huge storage silos. But those times are over and Auckland has to move on. Empty space in the central district of any city, directly at the water in particular, is hugely precious – nothing that is unknown to the city developers of Auckland and after years and years of planning the first part of this revived area has been opened to the public a few weeks ago. Maybe it was just a coincidence that the opening was just before the upcoming opening of the Rugby World Cup this Friday, but although the Wynyard Quarter will become a business and housing oriented area, the actual finished projects revolve all around leisure activities, hospitality and a few other bits that might actually be useful for the world cup and attractive to visitors. So let’s have a look at what New Zealand City developers think, a modern city needs. A look at the map reveals the position of the Wynyard Quarter. For orientation: On the right hand side of the map you can see “Viaduct Basin”. If you follow that direction, you can see that this will lead directly into the CBD and the very inner part of Auckland, where big business is made. Furthermore, when you look south of Wynyard Quarter you can see “Victoria Park” and “Beaumont Street”, that’s where I live, btw. West of Wynyard Quarter you can find “Westhaven Marina”, the infamous biggest marina in the southern hemisphere. The map is still showing the obvious: Wynyard Quarter was and still prevails as a mainly industrial area. Partly even with empty spaces, it seems obvious that things have to change a little bit around here. But that’s up for the future, we want to look into current achievements now. 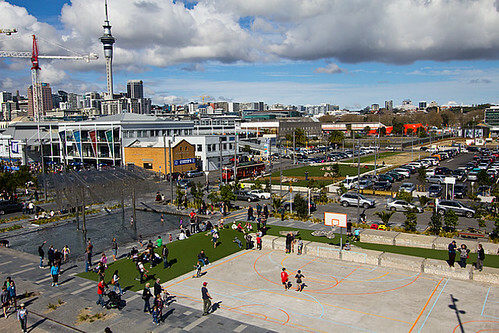 The new center of Wynyard is formed along Jellicoe Street and the so-called “Silo Park”. It got its name from the dominant concrete silos that sit right in the middle of it. Maybe they kept them as a tribute to “Lord of the Rings – The two towers”, who knows. Anyway, the area around those towers are mainly grass and playgrounds for children to make this an attractive spot for families. The biggest oddity is that strange “bridge into the void” thing, which I don’t really know what the idea of it was. It looks like a bridge, but it doesn’t connect anything. At the same time it seems to block the view onto some uglier buildings behind it and offers some good views over the inner CBD, but not so special that it could be called a lookout point. So what the heck is it really? Maybe I’ll find out one day. City view: The other side of silo park with the little pool that was very popular with the children that day. (It’s winter on this picture btw). The orange brick building is the Auckland Fish market and a good place for fish indeed. If you follow the left side outside of the picture you would come along the waterfront into Viaduct Basin and eventually the CBD. 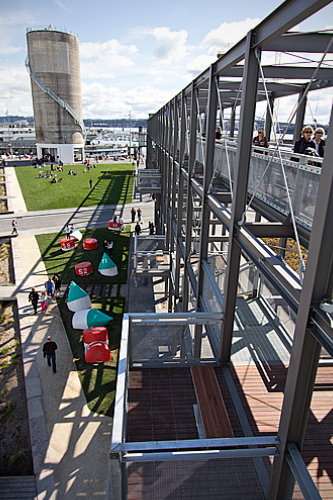 When you follow the road from Silo Park into the city you will come to the waterfront where they transformed old storage facilities into restaurants, cafes and bars. There is even an outdoor piano, open for everybody who can play – and you are better be able to! 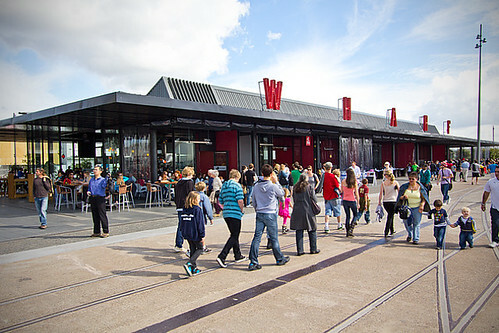 One of the Wharf restaurants on a Sunday afternoon. There are several buildings like that and I guess you could count around 10 to 15 different venues in that small street. All of them seemed quite posh and to be blunt – not really comfortable in a way of – comfy like a pub comfy. It rather seem to follow the overall approach to appeal to families and other kinds of settled people. Don’t get me wrong, there is no problem with that approach, I am just afraid if it is not a little bit of a overkill. This year will be a good one for the area as it will play an important role in the rugby world cup and therefore attract many visitors, but what will be in one or two years? Only the time can tell. Once you’ve passed all the restaurants you can relax from your heavy lunch meal and enjoy the city skyscrapers. In the fifties of the last century, Auckland made a huge mistake, they removed all of their trams which formed a very vital part of their public transportation system. I know the fifties were not the best decade for that kind of transport when everybody wanted to travel independently, but nowadays the after-effects of those decisions are more obvious than ever. In commemoration of these good ol’ times, the Wynyard Quarter got it’s old tram back. It goes on a loop around it along the water front and shares the street with cars and pedestrians. A round trip with the tram takes about 5 to 10 minutes I think and might be a nice one indeed. 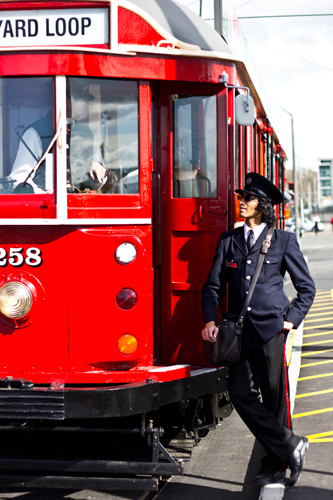 The Wynyard Loop Tram: The nice red colored tram and the uniforms of the conductors make the whole idea of a city tram quite charming. I’d wish Auckland could be more classy like that in other areas as well. The only problem here is that I am not sure whether the idea of the tram was to entertain tourists or to transport people. The infrastructure around that old tram looks like the one of a proper transportation system, the price of 10 dollars for a 10 minute ride although feels more like the price for a roller coaster. Indeed, a ride with the tram could even become like one. After I finished taking pictures and was about to leave this place, I saw how a car crashed into the tram. I have a strange feeling it didn’t happen for the last time. It is a rather odd place, the new Wynyard quarter. At this point it looks more like a peculiar leisure park in a run down industrial area prepared to handle thousands of tourists than anything else and yet it wants to be so much more than this. But it will need a few more years to develop the planned commercial and residential areas that will give the quarter its long striven-for beauty and make this a certainly nice place. And who knows, the Waterfront restaurants might be already closed at that point and Silo Park will be all forsaken and overgrown after the concrete structure of those old silos eventually crumbled away and the collapsing mighty tubes crashed into that strange bridge that always led into the nowhere anyway.